Join the Blue half of Manchester with official Manchester City football shirts and training kit in our MCFC Shop including the new Man City home kit, away shirt, 3rd jersey and a full full range of training kit including polo shirts, jackets, tracksuits and more. Personalise your Man City football kit with official name and number and Premier League sleeve patches. Adult, kids, baby and women sizes available. Fast UK and international delivery. 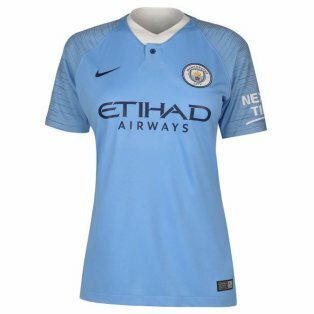 As one of the most dominant forces in the modern English game, sales of Man City shirts continue to increase on an annual basis and they are now among our bestselling Premier League football shirts. Having lived permanently in the shadows of city rivals United for virtually their entire history, the arrival of world class players such as Sergio Aguero, Carlos Tevez, Yaya Toure and Robinho helped put City on the footballing map as they won their first title in 2012-13 season. Playing at the Etihad Stadium, which was originally built for 2002 Commonwealth Games, City have demonstrated clear and concise strategy both on and off the field as they seek to become one of the biggest clubs in world football. The club have a devoted local fan base and were originally founded in 1880 under the original name of West Gorton FC. Although City are now synonymous with their sky blue home jersey, the initial West Gorton FC shirts were black. It was not until 1894, when the club became a limited company and adopted the Manchester City name that they adopted the sky blue jersey as their home colours. This design has remained consistent throughout their history and the jersey is worn either with matching sky blue, or white shorts and socks. In recent seasons, the club have rotated between white and navy Premier League shirt printing depending on the final detail of the kit. In recent seasons, Nike have favoured a darker away shirt which has either been black or navy. However, white was previously a popular colour, as was red and black stripes. With the introduction of third kits to cope with the demands of European competition (or to raise extra revenue, depending where you sit on the cynical scale!) 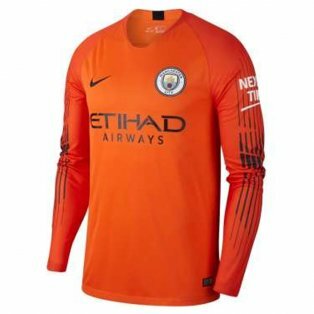 there have been some fairly unique Manchester City away jerseys, with lime green and purple among the favourites in recent times. The first commercial Manchester City replica shirts released for sale to the public were manufactured by Umbro, who enjoyed a long standing relationship with the club. Starting in 1974, the partnership lasted until 1997 when Kappa took over manufacture of the kits. City then enjoyed partnerships with Le Coq Sportif and Reebok before returning to Umbro in 2009, at the start of their new financial power. During this period, the club signed Robinho in deadline day and this led to the highest sales of City shirts in their history. Somewhat controversially, Nike became manufacturers of the City jerseys for the 2013-14 season. Having bought over Umbro, there were allegations that Nike essentially asset stripped Umbro by taking over the contracts for City and England before effectively dumping the Umbro brand. Manchester City have had a number of shirt sponsors over the years, the most notable of which were Brother, Eidos and Thomas Cook. They are now sponsored by Etihad Airways. Ahead of the 2016-17 season, City unveiled a redesigned club crest which was an updated version of the very popular circular badge worn in the 1970s. Keen to stick to tradition in an increasingly commercial game, the three central symbols, chosen by supporters, comprise a sailing ship (symbolising Manchester's history as a trading city), three diagonal stripes (representing the rivers Irwell, Medlock and Irk that flow through the city) and the red rose of Lancashire.